I always love when the portrait location that the wedding couple chooses is meaningful to them. So many clients opt to choose a location for their wedding day portraits without thinking long and hard about what that location means. Is it somewhere they have spent time as a couple? Is is a place that brings back fond memories of their relationship? Is it a particularly popular location and well-known in the city they chose to get married in? Are there any locations that are especially important to you two as a couple? This is where I'd suggest you start when it comes to picking a location. Is there a particular place where you had your first date? Where you proposed? Where you like to spend a lot of time together? Having a sentimental connection to the place where you take your wedding day portraits can really elevate that experience for you. What is your style like? If you're urban and city to the core, Central Park might not be the right spot for you. If you love being outside surrounded by nature, we might want to stay away from graffiti-lined tunnels and the cobblestone streets of DUMBO. What locations will best match your style as a couple, and the style of your wedding day? What time constraints do you have to consider? How far away can we travel within the timeline of your wedding day, and how far do you want to travel? If you're getting married in Brooklyn, do you really want to go all the way to Central Park for portraits? If you do, do we have time to make that happen? What will the weather be like? If you're getting married in the fall months, is there somewhere with amazing foliage? What about blooming flowers in the springtime? If you love a particular park in the fall but you're getting married in February, will you love it just the same with no leaves on the trees, etc? If your chosen location is going to be outside, have you thought about a rain plan? Is there an indoor location that works for you, while also working with the timing of the day? Does your rain plan location need a permit? Taking the steps to make these decisions before the wedding day will reduce any oh my gosh it's raining and we have nowhere to go! panicked discussions on your wedding day itself! 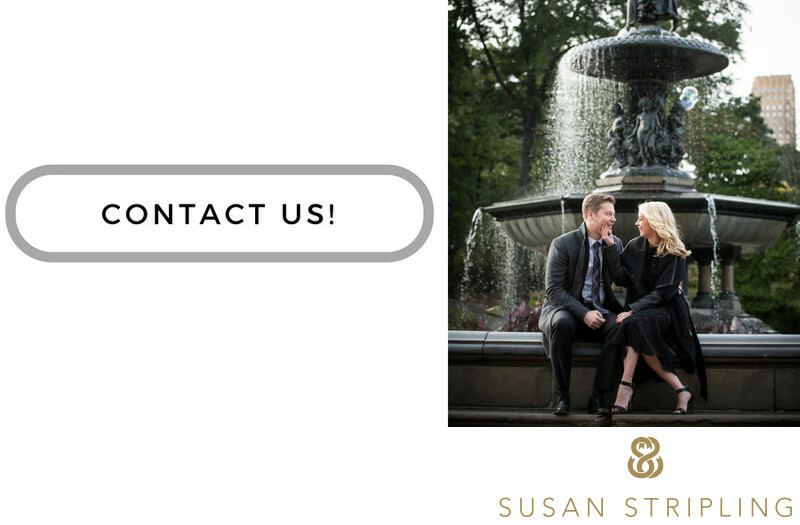 If you're getting married in New York, check out my list of favorite portrait locations in the city and surrounding areas. I update it every time I photograph portraits somewhere new, and it's been a great resource to my clients over the years! 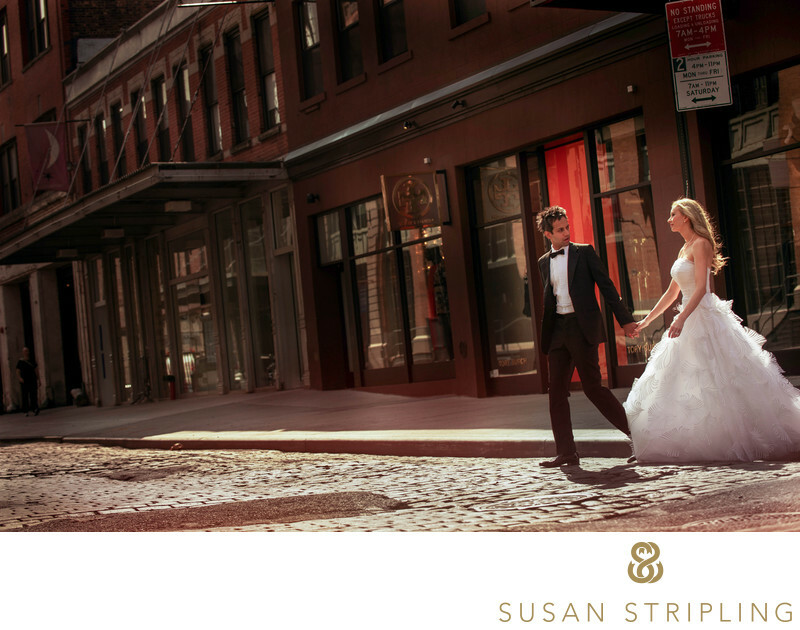 The bride and groom in this photograph resided in New York at the time of their wedding, and there is no more iconic a Manhattan location than the Meatpacking District and the Highline. Beloved by the couple individually and together, it made sense that it was where they began their wedding day photography experience. With both an Indian and a Christian ceremony planned within hours of each other on their wedding day the bride and groom knew that we would have to meet early in the day to begin their portrait session. With the early morning light streaming over the cobblestones we started shooting in the Meatpacking District at daybreak. I often speak about how much I love the light later in the day and it was a rare treat to get to work with equally gorgeous light in the earlier morning hours. Manhattan can be a crazy busy place but the streets were nearly deserted at this hour on a weekend morning! Location: 38-40 Little West 12th St, New York, NY 10014. Keywords: David Tutera (51), HIghline (21), Indian (168), Meatpacking District (15), New York City (207), Oscar De La Renta (27), Ray Roman (27), Skylight West (51), Sonnier and Castle (27). 1/800; f/4.0; ISO 200; 90.0 mm.